During a half-court game at the Northmont Girls Basketball Camp four campers ham it up for their favorite photographer. A player puts up a shot during a half-court game. Practicing shots from 3-point range. Campers huddle up with Northmont Head Coach Bethany Kincer and other instructors inside the gymnasium. CLAYTON — Northmont Girls Basketball Camp was held June 2, 3, and 4 at the Northmont High School Gymnasium. The camp included players in grades 2-8 and was held from 9 a.m. until noon each day. Campers learned the following skills: ball handling, shooting, passing rebounding, fundamentals of the game and participated in competitive individual events as well as competitive team events. 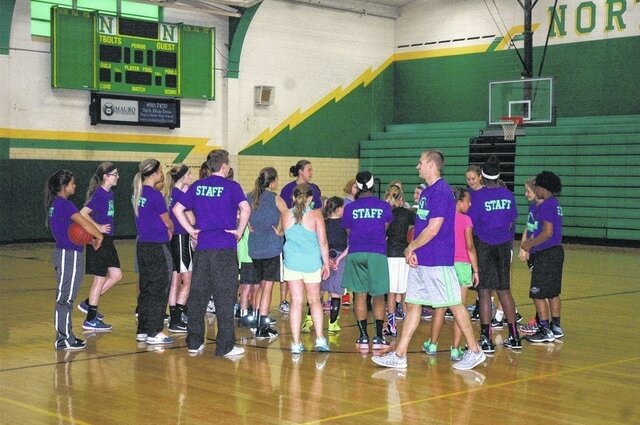 The camp was led by the Northmont High School girls basketball staff, current players and alumni. Each camper received a free Northmont Girls Basketball Camp T-shirt. Awards and prizes were presented for competitions at the end of camp.